This kit showcases a beautiful lace taken from a vintage garment. 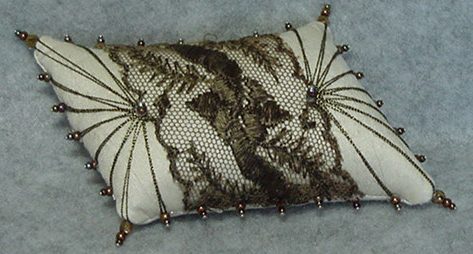 It is backed with ivory silk and embellished with metallic seed beads and bronze czech cut beads. Antique gold threadwork finishes the piece. These kits are each individually numbered and initialed by the designer. Please check availability before ordering.